Joe and Dorothy squabble about their fence boundary. 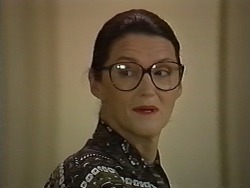 Dorothy accidentally runs down Bouncer in her car. Joe panics about Bouncer. 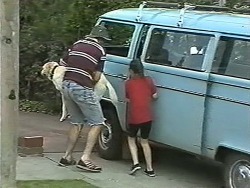 He picks him up and puts him into the back of his van. He speeds off to the vet. LOCHY:(to Dorothy) If Bouncer dies, everyone in this street will hate your guts!! Beverly is on the phone arranging a trip to a conference in Cairns - and she's leaving tomorrow. 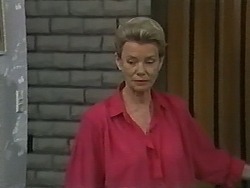 Jim is surprised, but Beverly says someone has dropped out at the last minute, so they invited her to speak. Jim asks if Ewan is going too. 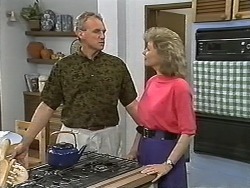 Beverly tells Jim that he isn't, but even if he was, Jim has got to learn to trust her. Kerry and Lochy are waiting for news about Bouncer. Kerry reassures Lochy that Bouncer is a very tough dog - he once ate rat poison and survived. Joe comes in and tells Lochy that Bouncer's leg is a bit crook, but he'll be right as rain in no time. It's clear that Joe is downplaying the situation though. Jim answers the door to Cody and Melissa, who've come to have a video evening with Todd and Josh. Beverly, Jim and Helen head off to the slide evening. Todd and Josh are playing cards and don't want to watch a video. Cody insists on joining in - she reckons she's a great poker player. Then she suggests strip poker. Everyone goes a bit quiet, but they come round when Cody calls them all chicken! They sit down to play. Todd and Josh have won the first couple of hands, so Cody takes off her hairband. Melissa hasn't gota hairband though, so she has to take off her top. Todd and Josh whistle at her bra. Joe and Kerry have been having a swim. They tell Harold that they're a bit upset about Bouncer and asks him to let them off the slide night. They go home, sadly. 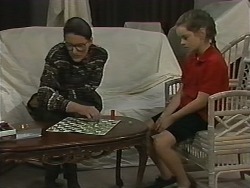 Dorothy and Lochy are playing Snakes and Ladders. Lochy is preoccupied about Bouncer. She says that Toby will never forgive her for not looking after Bouncer properly. She says that if Dorothy and Joe hadn't been fighting, this would never have happened. Todd and Josh have just taken their jumpers off. Unfortunately they lose the next hand too, so they have to take their T-shirts off. Dorothy has come round to see Joe about the fence. Joe immediately flies off the handle, but Dorothy calms him, saying it's time they put a stop to all this nonsense. She says she's prepared to forget the whole thing - Joe can keep the land. Joe asks her what the catch is(!) 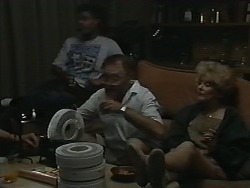 Kerry sushes him and thanks Dorothy, saying she hopes they can be much better neighbours from now in. Dorothy enquires after Bouncer. Joe tells her he's in a bad way but will pull through. Then he sheepish thanks her for asking. Joe is happy that the fence issue is resolved. 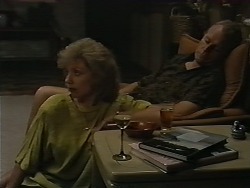 Kerry tells Joe off for crowing over Dorothy - she's really upset about Bouncer. Joe is upset too - he's such a link to his mother. JOE: I don't know what we're going to do. KERRY: Hey, come on. He'll pull through. JOE: Toby'll be broken-hearted if anything happens. Oh, Bouncer. Don't die on us now, boy. Finally, Todd and Josh stand up and pull down their boxers on the count of three. At that moment, Helen arrives home!